Remember we schedule based on demand. 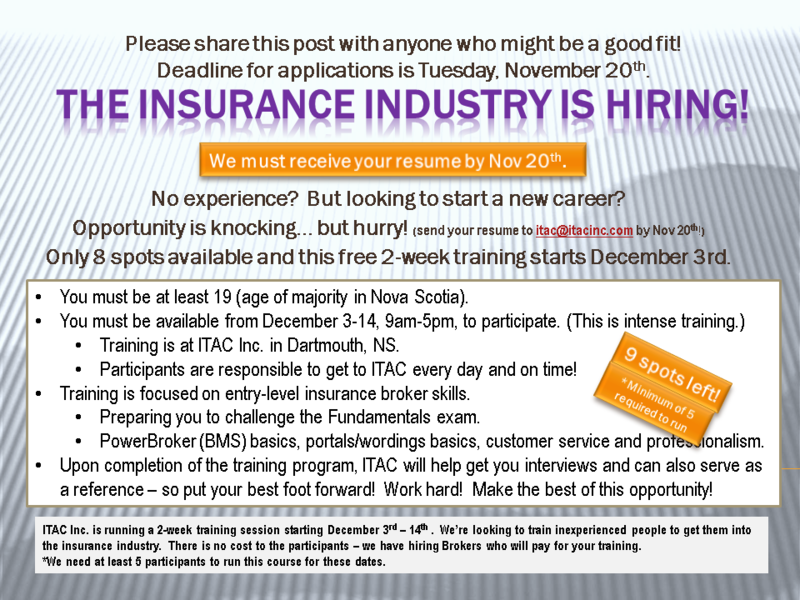 Here is an upcoming opportunity for brokerages who are looking for new staff. If you have just hired someone new to the industry, or you would like to train your receptionist to move into a CSR role, or you have an individual(s) who you think may be a good fit for the industry – they just need some initial training… contact us today about our upcoming 2-week training program – starting Dec 3rd. Webinars are currently being scheduled for CAIB 1, CAIB 2 and CAIB 3 – in preparation for the December 2018 IBAC exam sitting. Harmonized Life Licensing Qualifications Program requires at least 5 students to run Nov 19-24th, 2018. Other courses will be scheduled based on demand. Online is available for all ITAC courses. You can sign up early to get a jump on your course – please indicate your expected exam date on your registration form. You can also visit the Course Schedule link found in the menu for more detail and also to register.